It appears as if the time has come to find a new caretaker for my beloved 2005 Elise. I have owned it since new, having acquired it from Hunting Ridge Motors (Mark Starr) on 3/14/06. It has served, exceedingly well, as my faithful track car for almost ten years, including eighty-five track days, from 4/21/06 to 11/1/15. Yes, it has been driven hard, the way God and Sir Chapman intended. No, it was never "put away wet." It has been rigorously maintained over the years by Ferrari of Denver, T.J. Waszak, BOE Fabrication, Suspension Performance, InoKinetic and myself. It is heavily modified, with Phil and Andrew at BOE working their magic with the majority of the changes. As a result, it has served me exceedingly well as a purpose built tool for track days. I'm aware that street cars modified for track use aren't popular with the general population (e.g. 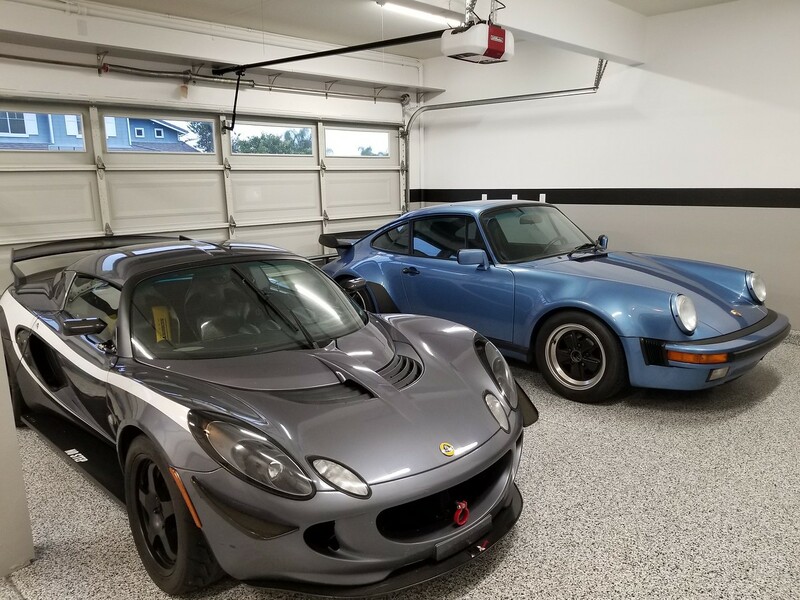 https://bringatrailer.com/listing/2005-lotus-elise-22/) and I know that if I want to maximize value that I should return it to as close to stock as practicable so as to appeal to as broad an addressable market as possible. While I have recently reverted a few items, including re-installing the original Sport Pack springs & shocks (that were originally removed in 2011 at 18k miles) and removing most of the vinyl graphics, I am, nevertheless, curious as to LT's opinion as to the vehicle's value as currently configured? DMC Ultimate 2ZZ Exhaust Header (black ceramic coated), ARP Exhaust Studs, BOE Silent Touch muffler, BOE Catch Can, GPAN2 Baffled Oil Pan, Circuit Worx Oil Pump Gears, Pro Alloy OE Replacement Radiator, Spal 9” Pulller Fan, BOE Pressurized Swirl Header Tank, BOE rear mounted oil cooler (original front oil coolers deleted), Canton Racing Products spin-on oil filter, Innovative front and rear engine mounts, Pro Alloy fourteen gallon fuel cell, Walbro GSS 341 Fuel Pump. Original, open differential, transmission, ACT HDSS clutch, LETSLA precision shifter linkage (set to stock throw), Suspension Performance shift tower support, updated shift cables. Original early black Sport Pack wheels (refinished), Toyo Proxes R888 195/50-16 & 225/45-17, Original sport package suspension with 18k miles, InoKinetic MONOball wishbone spherical bearings front and rear, Inokinetic Bullet Nose wheel stud kit, InoKinetic V2ARMS, front suspension uprights machined 0.100” (the combination of which allow up to approx -3.0° camber), Lotus Super Sport adjustable anti-roll bar and aluminum mounts, InoKinetic V2LINX adjustable anti-roll bar end links, Full Race BOELinks toe links. InoKinetic Ultradiscs front & rear, BOE 2 Pot Caliper mod, Carbotech XP12 front and XP10 rear pads, BOE Stainless Steel Vented Race Caliper Pistons, stainless steel braided brake lines, Castrol SRF brake fluid. Reverie Mulsanne C carbon fiber seats, InoKinetic Tallrails driver’s seat mount, Schroth Hybrid II 6-Point HANS harnesses (pull up lap belts), OE Lotus harness bar and mounting hardware, Reverie carbon fiber door panels, Works Bell Rapfix II quick release steering wheel hub, OMP Trecento Alcantara steering wheel, passenger side airbag delete, HVAC delete (windshield defrost functionality retained via 4” bilge blower), Battery kill switch with alternator protection, Braille B2015 front battery relocate (under fusebox), Halon handheld fire extinguisher and mount, TraqMate, InoKinetic Micro Mirror (black), BWR Unikey. APR Performance carbon fiber front splutter, APR Performance carbon fiber canards, windshield wiper vertically clocked, carbon fiber Exige side scoops, BOE Tilting Clamhinge Kit, BOE Street Diffuser and diffuser brace / panel delete, HKFever Carbon Fiber Exige 2010+ carbon fiber wing element and OE uprights, InoKinetic RACESILLS (IMRP Side Sills), InoKinetic folding front tow hook, BBhook rear tow hook, vinyl side graphics, Stealth front turn signal bulbs. The original body colour was Graphite Grey metallic, Lotus paint code B108. The interior was trimmed with black leather. Factory optional extras were: Lifestyle paint, hard top, sport pack and touring pack. The car also had the distributor optional Star shield installed at the port in the US. The car was signed from production on the 20th August 2005. The car was imported into the USA by Lotus Cars USA Inc. who would retain any further history. Their records show the selling dealer was Hunting Ridge Motor Sports in Port Chester, New York who sold the car to you in March 2006. The Elise was launched into the US market at the start of the 2005 model year, with the first 2 cars being used for engineering. The following is based on serial number sequence and data available to date for the USA market 2005 model year Elise only, of which there were 3323 cars in total; Your car is the 148th out of 151 cars in Graphite Grey, Your car is the 73rd out of 74 cars in Graphite Grey with black leather trim, Your car is the last out of 26 cars in Graphite Grey with black leather and the same factory options, if we include the distributor optional Star shield this reduces your car down to the last out of 15 cars. Graphite Grey was the 7th rarest colour out of the 16 colours available for the US 2005 Elise. 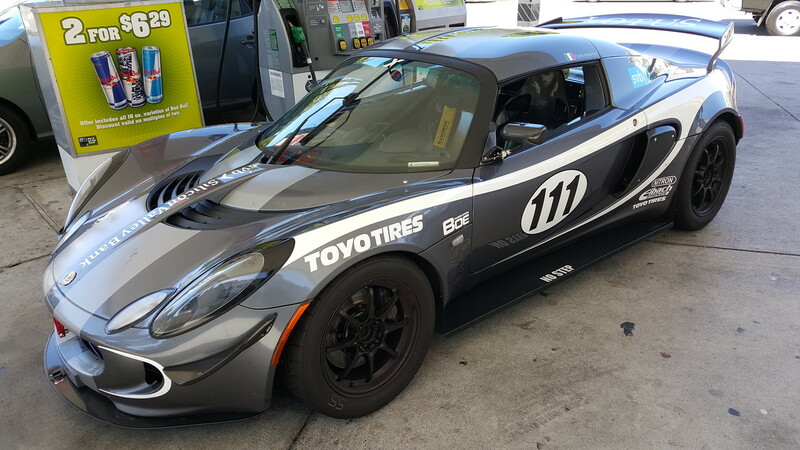 The total US Elise production from 2005 to 2011 was 5206 cars with 4938 of them being normally aspirated. So, please let me know your thoughts regarding valuation. First pic below is the vehicle as currently configured. The other pics show the car with the previously installed graphics. Hi would you be willing to sell your front tow hook by any chance? I could see someone paying $35k at least for this car since it's supercharged. Even salavge title elises are getting to the $30k. The only thing that I think is bringing down the value of your car are the front canards and the wing. Edit: that is to say, it's not really lowering the value but rather limiting the market for you. Me personally, I would be all over this car if it weren't for those two things. But to fix that you'd have to repair the drilled fiberglass and respray. Too much work for me. So you have to be lucky and find a buyer that actually wants those things on the car. Last edited by robbieeeeeee; 09-03-2018 at 07:38 PM. Is it street legal and CA smog compliant? The years of track use, the drilled larger rear wing and canards are all considerable deterrents to buyers. canards are all considerable deterrents to buyers. To this point, I could come across the most perfect car at the perfect price -- but if it has canards installed, I'll move on. Salvadore Dali was an amazing artist, but his mustache should not be on cars. To clarify, I know why people put canards on cars... but, to me, the aero benefit is not worth ruining the front end of a car. Last edited by HondaCRX; 09-04-2018 at 07:57 AM. First off, thanks for all the responses! Please keep 'em coming. Thanks for your thoughts. This isn't my first rodeo, so I understand that the market is narrower for modified vehicles. I'm just trying to ascertain what a baseline value is as the vehicle currently sits before I do things like remove some of the aero, return the interior to stock, revert the brakes to stock, etc., etc. I have most of the stock parts. I'm not in a rush and I like turning wrenches. I'll let you know if I opt to sell the tow hook separately. The vehicle is titled, registered and insured. I would need to remove the Rev300 for CA emissions compliance. It was acquired with the express intent of being a track toy. An Exige Sport Cup was not an option for me as I have no interest in owning a trailer or a tow rig. Assuming I don't opt to sell as-is, what are your thoughts on removing the side graphics? Last edited by Frank Amoroso; 09-04-2018 at 08:54 AM. Frank, I encourage you to attempt to sell as is before parting out. I just purchased something close to yours recently....yours would have won out depending on price. I specifically targeted a car like yours and if someone like me is doing so there must be others. I will say that I found four others in the same class within the last six months with varying pricing from mid-upper 30's thru low 40's. All cars are compromises and while not a fan of extreme aero and tons of bling a couple of the cars were equipped that way and I took it into account with each one I looked at. Thanks for the note and congrats on finding what you wanted! I am currently located in Southern California. Imo its great the way it is, and its still very much a street car not a pure track car, so you have a relatively wide audience. The brakes are a definite upgrade which many peopel do regardless. Maybe the seats are a bit much for someon more strete orientated, otherwise I wouldnt change a thing, and the car looks really clean. Maybe advertise it as a very useable streetcar thats upgraded to work on track weekends, theres a large lotus comunity for that. smokin orange and rsamani like this. 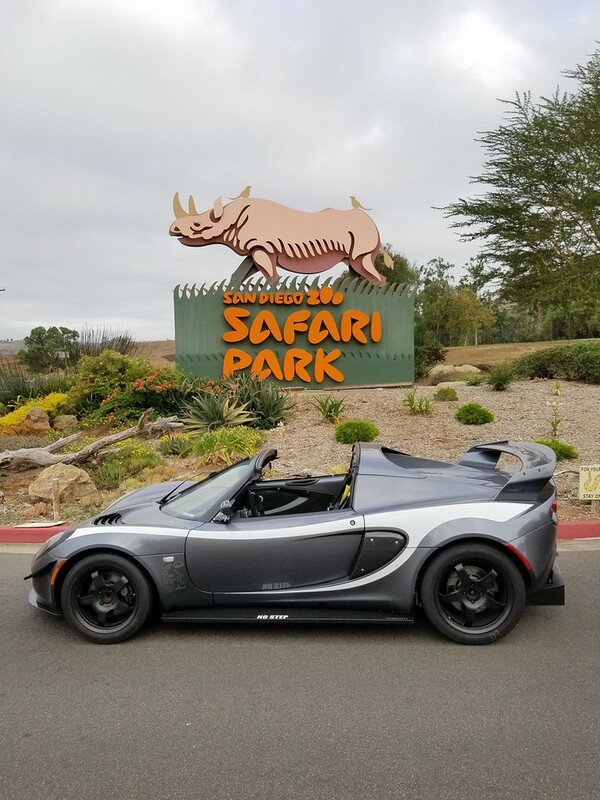 Speaking as a guy on the opposite coast who just bought an Elise for street use plus a few track days, I think this is a very appealing car. My car has been very little driven and has the usual assortment of small issues an under-used car has. Yours has been used hard, but because of that has been well cared for and has had quite a few appealing upgrades. I would certainly not worry about the use/wear of the car as you have obviously been meticulous in caring for it. In my valuation, it would be worth what a well-tended, gently-used unmolested example would be, because the significant upgrades and documented good care balance out, or even enhance the value of the car. Certainly the Nitrons, harnes bar, and harnesses did so for my car. As long as it's street legal and comes with enough street bits to be somewhat practical as a street car, I'd be all over it because it has had all the prep done and is well cared for. Thanks much for all the thoughts! Straight pipe exhaust. 115 dB of loud & proud. Man... if I had a tow vehicle to take this to the track, I'd totally take it off your hands rather than modding my own car. CA makes engine mods so hard, though! The CARB will fail a perfectly clean car for having anything aftermarket on intake/exhaust, even if the sniffer test is totally clean. First of all, car looks great! 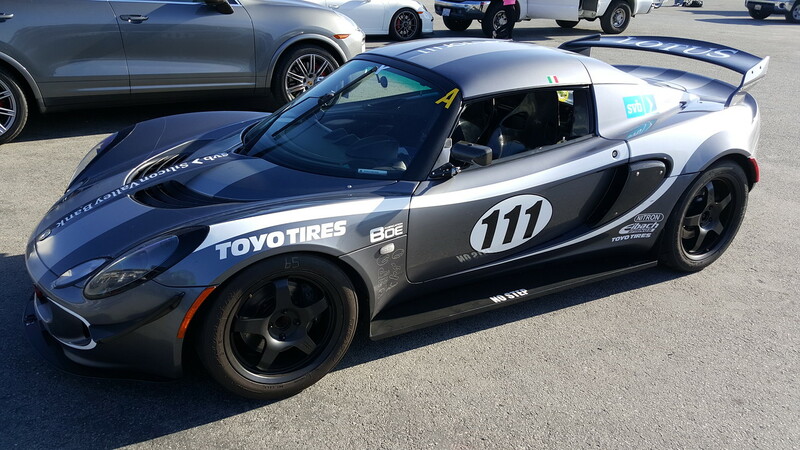 I just picked up an '05 Elise, also Graphite Grey, with the intention of progressing into as a track focused car. Your car is an awesome example and buying it would have saved me a bunch of time and money. ~$36k would be an awesome deal for someone. The market is narrow for a car like this, but buyers are out there. I do think it is an all or nothing affair though- sell it fully prepped as a turn-key trackcar or revert it as far back to stock as you can; A car only partially track modded will fetch a lower sale price than a stock one and be harder to sell, even if it has a few pricey mods left on it. I do think that removing the rest of the graphics would help broaden the audience as well as posting some detail on how the wing and canards are mounted. BTW, what mirrors are those? I'll keep an eye out if you decide to part it out. Goodluck! This car is absolutely stunning in the flesh! I think it looks great as-is. I would say with the mileage and mods a fair price would be around $37k. hopefully it has sold by now. the last post before you "crazy05" was from sept.
Bring A Trailer accepted it, but... I've been slow to have the headliner replaced and take photos, etc. So... it's just been sitting in my garage all lonesome and forlorn. I'll likely pull the aero (I have body colored plugs for the canards and wing) and re-install the interior prior to listing it on BaT. 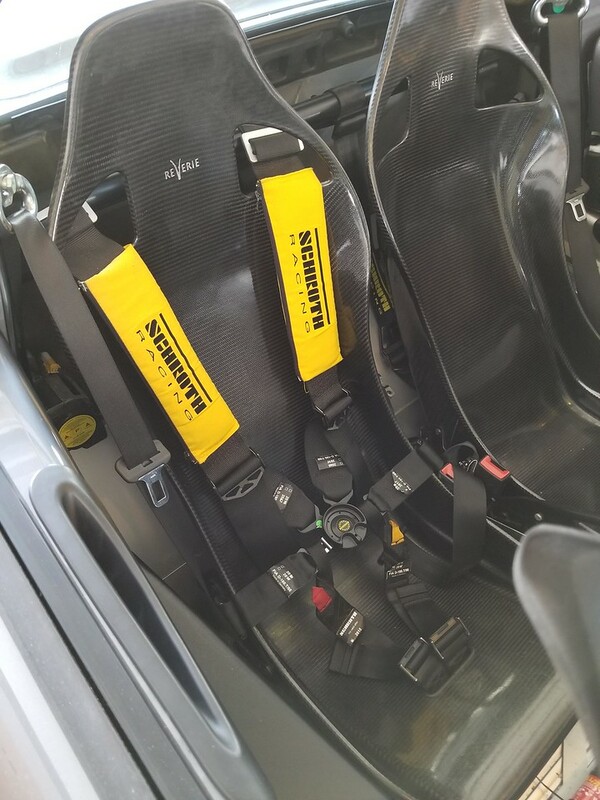 Anyone want to trade their stock Elige seats (plus cash) for the Reverie carbon fiber seats? I should pull the side graphics, but... perhaps I'll leave that up to the winning bidder. I have sold my 528i, with M Sport package, and I'll market my 1988 Porsche 911 M491/M470 cabrio after my Elise finds a new caretaker. The herd is being thinned!